‘Kay . . . got that lesson drilled into me. Looking after Sable didn’t leave me much choice. I made the decision to keep her alive after she lost her sight; I damn well had to learn how to look after her properly, which demanded that I slow down. Trust me: other than driving, you can’t do a heck of a lot quickly with a twelve-year-old deaf and blind German Shepherd in tow . . . well, except for learning patience: that comes quickly. I hadn’t yet arrived at the sea — but in the meantime, my dog certainly seemed to be trying to teach me patience and faith. Serenity, however, was another matter. For being patient with Sable didn’t automatically remove the underlying panic that lurked below the surface of my slower-moving exterior. If anything, at first I found that being forced to physically slow down actually caused my anxiety to increase exponentially. At least when I was in busy-bee mode — zooming around, attempting much and accomplishing not so much — I had the illusion of living purposefully. Slowing down, however, was going to entail far more ‘being’ than ‘doing’ . . . and this, I soon realized, was not a skill to be mastered overnight. In fact, rather like a drug addict trying to quit cold-turkey, being yanked out of busyness was initially akin to withdrawal. When a mind obsessed with checking tasks off a list begins to ask the bigger questions about one’s life, the lure of the daily details soon becomes all-consuming again. Similar to the sea, it would seem that patience and faith are not permanent . . . they come and go like the ebb and flow of the tide. But it all worked out beautifully and as I settled into my new life and home in the town of Sidney by the Sea on Vancouver Island, I returned again to one of my favourite authors for wisdom on this serenity business. This sounded lovely but I could never seem to get the hang of it in daily life. Ever since I was a kid, my natural tendency had been to spend the present moment thinking or worrying about future moments. And because of the path I chose after John’s death, much of my last decade was spent thinking, writing, and speaking about the past. But last summer, I began to realize that at some point in the fairly near future, due to Sable’s age if nothing else, the future wasn’t going to include her. And since the present was where she was, that’s where, at long last, I began to learn to live. Well, sort of — for old habits die hard. Which might be why the Universe sent in the big guns (a completely dependent creature) to get through to one of its, er, slower students (that would be me) on the finer points of slowing down and being in the moment — which bring us back to the Zen-portion of the program. Now, obviously Sable was a living creature versus an inanimate object — but I suspect the key word in the above quote isn’t the noun, it’s the verb: caring. Maybe it’s not what or who we love that is as important as how we do so. For it wasn’t until last summer that I truly began to understand the significant difference between “looking after” another and “caring” for another. I suppose this is as good a place as any to bring up the rather obvious point that Sable was a dog versus a child, spouse, sibling, parent, friend, or any other mortal companion. To some, the fact that she was an animal might lessen the importance of the impact caring for her had on me. But Sable was what I was given to care for during that period of my life — and care I did. As I mentioned in the article, Zen and the Art of Elder Dog Care Part 1 — Awareness, it wasn’t until Sable depended on me to implement three key strategies for living a more balanced life — putting barriers/boundaries in place, asking for help, and focusing on priorities — that I was actually able to do so. Likewise, I was really only able to reach that Zen meditative-state — that inner peace of mind — while caring for another being. Hmmm . . . there seems to be a theme here. Ah hah! For in contrast, meditation to me used to mean sitting cross-legged in my living room, staring at the flame of a candle while trying to quiet my mind. This sometimes worked for five seconds or so. Yoga, which I’ve taken up since moving to Sidney, is a bit better. As I sit cross-legged on my yoga mat in a yoga-class, listening to the yoga teacher repeatedly remind me in a calm and soothing voice to focus on my breathing, this does get my mind off my thoughts — in ten-second increments. In other words, my trying to ‘be’ in the present moment wasn’t inducing much in the way of a Zen-like state. Rather, it was when I was doing an activity that involved caring for Sable, loving her, I began to experience the meditative state that Zen can bring — because that’s when being in the moment, being fully present, actually mattered. For if I let my mind wander when I walked Sable around the block, she’d walk into a telephone pole. Unfortunately, I say this from experience. Then I began to realize that being in the moment always matters. Why? Because caring for Sable — walking her around the yard, preparing her home-cooked meals, hand-feeding her, taking her to the vet, helping her in and out of the back of the car, bringing her water in the night, helping her get up from the slippery hardwood floor, hiding her treats and watching her sniff them out (with or without sight, “search” was her favourite game!) — took my mind off my own damn self and my incessant, never mind exhausting, determination to make my corner of the world a better place through work. Gently guiding a blind dog up a mountain trail was compassion in action and probably spoke far louder than words ever could. For me, it was the process of caring that became a portal to the Zen-like state. And yes, I did experience moments of serenity. But mostly I felt reverence. It was like reconnecting with an old friend I hadn’t seen in years. For I have felt the magnificence of reverence before — at the top of a mountain while skiing or hiking. I’ve felt it in the forest, surrounded by trees. I’ve felt it at the beach, watching the waves and I found it again while sitting on my kitchen floor, holding Sable’s food-dish in my hand as she picked through her kibble for the choice bits of beef. I also felt reverence, eventually, during our 3 a.m. sojourns into the backyard. 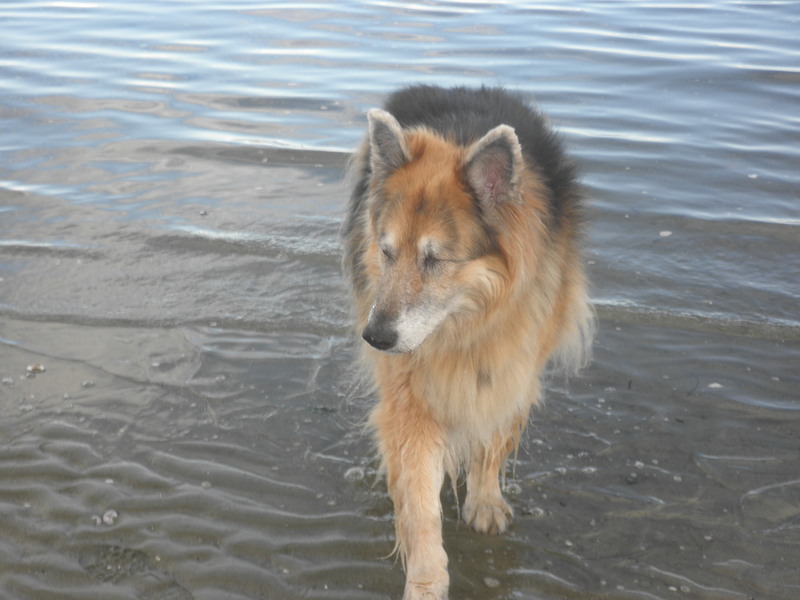 At thirteen, Sable was starting to experience kidney failure so she was drinking a lot of water and therefore couldn’t make it through the night without a pee-break. When this routine first started, I found the middle-of-the-night treks tiring and inconvenient. But then one night, I actually looked up and saw the starriest sky I’d seen since the Sahara desert. I was again reminded that we are all part of something far larger than our individual selves. This is also what caring for Sable did for me. By forcing me to slow down, she inadvertently helped me find my way back to my old self and all the activities I used to love to do — hiking, gardening, swimming, walking on the beach, eating, camping, road trips, reading in the hammock or on the couch — before I turned into a task-obsessed, rather joyless workaholic living in a constant state of reacting. 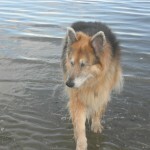 For once I learned how to care for a blind dog (de-toxing at the rehab centre, if you will) I began to have fun again. What a concept! Sable, Soda and I explored our new neighbourhood and the nearby beaches, lakes, and forests. We went wilderness camping in Uclelet, where I awoke to see Sable lying on her back, wedged between the side of the tent and the edge of the air mattress with all four legs sticking up in the air! May I be that adventurous and easy-going when I’m ninety 🙂 We went to the Kingfisher spa, Rathtrevor Beach and on a two-week road trip to Oregon and California with my friend Terri. I had more fun in those four months than I’d had in years. Perhaps similar to a recovering addict, I began to look back on my old Calgary life with new eyes. There, I worked all the time. Why? What had I been trying to achieve . . . or prove? I lived in fear of the phone ringing, dreading the next demand placed on my time. What now would be asked of me that would take me away, yet again, from what I really wanted to be doing: writing and spending time with my dogs? Maybe the more important question to have asked myself would have been: why couldn’t I say no? Well, I’m asking it now. For that is an entire decade I’ll never get back. And thanks in part to Sable, it’s not one that any future decade will ever resemble. Last fall, I began to realize what I was learning through caring for Sable was how I wanted to live the rest of my life . . . gracefully, gently, carefully, compassionately, courageously, authentically, patiently, and perhaps most importantly, joyfully. Not surprisingly, it was Sable herself that let me know whether I was still on the right track or not in terms of caring for her in the manner to which she had become accustomed. If she was smiling, I knew she was happy and felt cared for. If she wasn’t smiling, I knew I had slipped back into ‘looking after’ mode. At the end of November, Sable stopped smiling. Looking back now, it makes sense that the start of the rainy season corresponded to my working more and laughing less. Sure enough, being the effective teacher that she was, Sable left one of the toughest and most important lessons till the very end. The cosmic clock struck again in December 2010 when, six months after she went blind and two months before the end of her life, she began to bleed from her nose. Maryanne Pope is the author of A Widow’s Awakening. Maryanne also writes short stories, play scripts and screenplays. She is the Founder and CEO of Pink Gazelle Productions Inc and the Board Chair of the John Petropoulos Memorial Fund. Maryanne lives on Vancouver Island, British Columbia.